Under the tab 'Staff', you will see a list of all your staff that has not activated their account yet manually or through the Activation Email. Click the option 'Send Activation email Now' and all the Not-Activate staff who has email added to profiles will get a welcome email. Or click on staff profile and under the Overview > Admin Actions > Status. 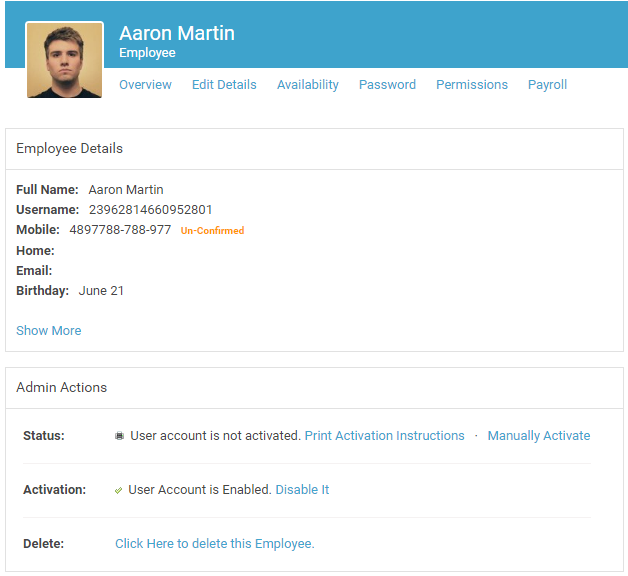 If a staff member does not have an email, you will be able to print the Activation instruction for them. Lastly, Manually Activate in which case you need to set the username from 'Edit Details' page and Password from the top to manually hand over the account login details.